Thanks for visiting our website. Here you can find information about Dynamic Tonality. This page will be updated with news, audio, videos, and software. Please check back often for the most up-to-date information. Our "big" paper about perfect balance, which we have been working for some time, is finally published. It is about the deep and intriguing mathematics behind perfect balance, and its musical ramifications. I have uploaded a preprint; the "version of record" is available at https://doi.org/10.1080/17459737.2017.1395915. XronoMorph has been updated to version 1.5.0. Numerous user interface enhancements. For example, tempo can now be changed by speed (revolutions per minute) or duration (length of revolution/period); the long/short beat ratio can be displayed for every well-formed level; balanced polygons can be rotated in pulse units (in addition to degrees, radians, or turns). There is no longer any requirement for Java to be installed. Polygon channels can now pass through MIDI tracks unchanged (by selecting the "–" option in the MIDI track channel menu). This is useful when sending MIDI to multitimbral synths. 18 new perfectly balanced but irregular polygons—all possible primitive minimals found in 42 equal divisions of the period. These are great for creating complex polyrhythms mixing 3s, 4s, 6s, and 7s. In addition to the golden (φ) ratios, silver (δ) and bronze (σ) ratios are now available in well-formed mode. These "special" ratios produce deeply non-isochronous rhythms where the beat size ratios of successive levels periodically repeat. MIDI options available in the interface to allow MIDI ports to be disabled. MIDI learn (this feature is still in beta and not yet hooked up to the preset system—that will come). Audio, MIDI, and Scala file save now work correctly on all platforms. Startup time is much improved. Switching to PB mode sometimes results in incorrect tempo, now fixed. MIDI sync—XronoMorph will sync to your DAW's MIDI clock and SPP (song position pointer). The number of DAW beats (quarter notes) resulting in a full XronoMorph rotation can be freely chosen. We have an exciting new release called XronoMorph. It is a free OS X and Windows app for creating multilayered rhythmic and melodic loops (hockets). Each rhythmic layer is visualized as a polygon inscribed in a circle, and each polygon can be constructed according to two different mathematical principles: perfect balance and well-formedness (aka MOS). These principles generalize polyrhythms, additive, and Euclidean rhythms. Furthermore, rhythms can be smoothly morphed between—as shown in the graphic below—and irrational rhythms with no regular pulse can also be easily constructed. More information and a download link is available on the XronoMorph page. Looking for the rhythmic loop generator "MeanTimes" described in our recently published Computer Music Journal article? This app has now been subsumed into a new app "XronoMorph", which generates perfectly balanced rhythms as well as well-formed rhythms. XronoMorph will be released very soon. We have made some minor updates to Relayer (version 1.0.1) and Transformer (version 1.0.2) fixing some graphical issues. We have released a new version of Relayer (version 1.0.0), with a number of usability enhancements, greater functionality and under-the-hood improvements. You can now save all settings in presets, which hugely reduces set up time. The pitch bend algorithm has been improved: it is more efficient, it allows any number (up to 16) of channels to be used, and channel 10 (which is reserved for percussion sounds in some synths) can be included or omitted. Importantly, with respect to Pianoteq, we include a workaround for Pianoteq feature that plays only the first pitch when multiple events with the same pitch number and velocity are received in close succession (Pianoteq introduced this to deal with faulty controllers, but it breaks compatibility with some microtonal tunings). Relayer now also supports realtime MTS (the official MIDI Tuning Specification). Tuning information can also be sent out as polyphonic key pressure messages for the hardware synths that support this and can remap this message to pitch. It also now possible to create custom maps from your MIDI controller (note number and channel) to numbers of generators and periods. Once a custom map has been defined, it can also be transformed (transposed, rotated, etc.). We have released minor updates to 2032 and The Viking to improve compatibility for certain Mac setups. The Windows versions are unchanged. We've also released a minor update to Transformer addressing some GUI issues and the Tuning Slider showing the wrong position on start-up. We have released a new analysis-resynthesis synth called Transformer. It transforms an audio sample, or live audio, by separating it into pitched components (partials) and noise. The amplitudes and frequencies of the partials, and the balance between noise and pitch can then be dynamically adjusted. As with all the Dynamic Tonality synths, it supports a wide range of microtonal tunings and the partials can be retuned to match the underlying tuning. We have also released a small update to the OS X version of Hex, which fixes a problem where the delete key did not work as expected. We are planning a couple of new updates/releases over the next few days. We have just released version 2.1 of Hex. We have decided to have just one version of Hex and to keep it free. Version 2.1 is multi-track, allows an unrestricted range of note layouts and has MIDI file export. It also has a number of small bug-fixes. Additionally, we hope to have a new analysis-resynthesis synthesizer called Transformer available very soon. It is based on TransFormSynth, but has been radically redesigned to make it fully compatible with all the other DT apps, simpler to use, and with a much easier installation procedure (unzip and run). As you may have noticed, we have also tidied up the site and added a new FAQ section into the new About page. In the near future, we also intend to upload a new step sequencer that produces well-formed (MOS) rhythms. Stay tuned! The new version of Hex is now available for download. This version has been completely redesigned from the ground up, and is significantly faster, smoother, and overall better and more intuitive than the original version. Please check it out in the Hex section. Hex will now be available in two editions: Free and Professional. The free edition has a few minor limitations such as no multi-track functionality, but overall it is very usable. At the moment, the only option is the free edition, because we want to get some feedback before we release the professional edition. The synthesizers will remain free of charge. Speaking of which, in addition to the release of The Viking yesterday, there is also a minor update to 2032 available for download. This new version is fully compatible with the new version of Hex. We have some very exciting news today. First, we are releasing a new version of The Viking that has been rebuilt completely from scratch. This new version offers unique new functionality and is finally compatible with both Windows and Mac. See The Viking's page for more details. Also, a new version of Hex has been completed and will be posted here very soon. We don't want to give away too many details yet, but the new version is very significantly faster and more usable. It is also worth noting that we are converting to a new, more comprehensive format for transmitting Dynamic Tonality MIDI messages, which all the new software will use going forward (backwards compatibility will not be maintained). The new format will allow you to use Hex to control all of the synths' Dynamic Tonality parameters. We've uploaded a new video of a Dynamic Tonality performance—Yak Butter. Note that the new versions of Hex, 2032, and Relayer, are not compatible with the old versions. So, if you update one, you should update them all. We hope you enjoy (if you do - please email us to let us know!). Also in the works... a C++ version of Hex - many more features, much more efficient, and generally better. A new version of The Viking (an additive synth, disguised as an old-fashioned subtractive synth but with dynamically alterable microtonal tunings and spectral matching) for Windows and OS X. To coincide with the publication of our Computer Music Journal article about Hex, we have a new version (v1.5) available with some significant updates. Hex is a free MIDI sequencer designed to make sequencing music in and across a large variety of novel tunings as straightforward as it is in twelve-tone equal temperament. It replaces the piano roll used in conventional MIDI sequencers with a two-dimensional lattice roll in order to enable the intuitive visualization and dynamic manipulation of tuning. It is compatible with the Dynamic Tonality synths—TransFormSynth, The Viking, and 2032—and, for static tunings, with any synthesizer that handles channel pitch bend. The lattice now shears, rather than rotates, when the tuning is changed. This looks much neater—particularly for more "extreme" tunings! The use of shear means that octaves are always vertically aligned. It also means that, in addition to vertical distance on the lattice being proportional to pitch, horizontal distance is proportional to distance along the cycle of (pseudo-) fifths. Adjacent Predominant Seconds (APS) layouts* are now available for any MOS scale** with nineteen or fewer tones. You choose an MOS scale by selecting its number of large and small steps in the Setup window, then click on "APS" to display the appropriate APS note layout for that scale. 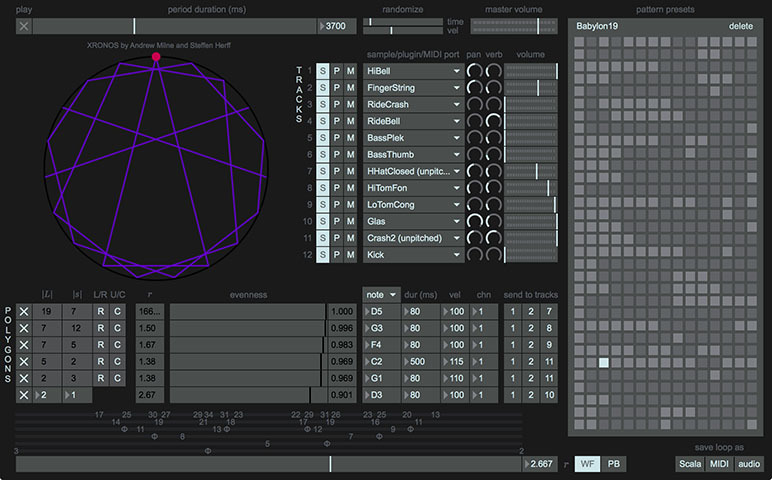 Hex now supports microtonal pitches for standard multitimbral synths. In Setup, you can select either "DT" (for a Dynamic Tonality synth, like 2032) or "std" (for a standard multitimbral synth, like the synths built into Windows and OS X, or SimpleSynth, or Virsyn Tera, etc.). In both cases, the tones are played at the correct microtonal pitches. When using a non-DT multitimbral synth, Hex uses pitch bend to get the correct microtonal pitches. You can play the hexagons by clicking on them with a mouse (or finger, if you have a tablet). This is a great way to find the correct pitch when composing in an unfamiliar scale or tuning. If you want to know more about Hex and its new features, please check out the CMJ article, or the free preprint (the draft version prior to peer review). * APS layouts are isomorphic generalizations of the Wicki layout, and are applicable to any MOS scale. In an APS layout, the most common (predominant) steps (e.g., diatonic wholetones) run along rows, while the less common steps (e.g., diatonic semitones) are given by a "carriage return" to the next row above. To learn more about APS layouts, try the above-mentioned CMJ paper. ** MOS scales (also known as well-formed) have only two steps sizes that are evenly distributed. Familiar examples are the pentatonic and diatonic scales—the first has 2 large steps and 3 small, the second has 5 large steps and 2 small—but there are numerous unfamiliar possibilities that may hold great musical potential. For a technical discussion of MOS scales, try our paper Scratching The Scale Labyrinth or the free preprint. 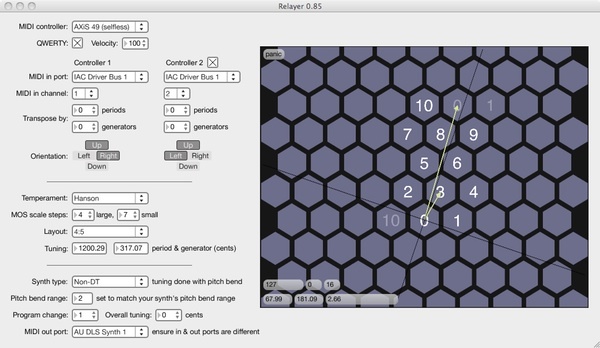 A new app called Relayer is now available (Mac version or Windows version). Relayer enables musicians who play the AXiS-49, the QWERTY computer keyboard, or the Thummer, to play in a wide variety of isomorphic note layouts and tunings using either a Dynamic Tonality synth or a standard multitimbral synth. We've uploaded a new video of a Dynamic Tonality performance to the Media section, and a new sample .hxp (Hex project file) to the Hex section. Our first version of 2032 is now available in the new 2032 section. 2032 uses modal synthesis to model physical objects, but integrates Dynamic Tonality in order to eradicate, annihilate, eliminate, devastate, incinerate, exterminate, mutilate, obliterate, and/or pound into oblivion the laws of natural physics. It is fully compatible with Hex and any standard digital audio workstation, and works on both Windows and Macintosh computers. We have also made a small update to Hex, which is available in the Hex section. Hex, our Dynamic Tonality MIDI sequencer, is now available in the Hex section. It is a free download, and works on both Windows and Macintosh computers. Over the next week or two, we will be updating 2032, The Viking, and TransFormSynth to ensure full compatibility with Hex. Obviously it's been some time since this website has been updated, but on the bright side, we've been busy bustling along with Hex and 2032, which will both be available very soon. In other news, our article mentioned below was published in Computer Music Journal and is available here. We are also working on a new article about Hex and 2032 which is nearly complete. The site is undergoing some changes in preparation for our article "Spectral Tools for Dynamic Tonality and Audio Morphing" which will soon be published in Computer Music Journal. We are also making significant progress with Hex (a forthcoming sequencer designed specifically for composition with Dynamic Tonality), and a new DT modal synthesizer, 2032. These should both be available in late December, along with an accompanying paper. In January, we are planning to port The Viking over to Max/MSP so that Mac users can try it out. In preparation for the Haptics and Audio Interaction Design (HAID) 2008 conference in Jyvaskyla, Finland, we have updated this site with much more useful information. Our demo submission paper can be found in PDF format here. Hello to everyone from the conference! The site is now up and running. Please bear with us as we fill in the content over the next few weeks. We're currently finishing up an extensive learning section where you can read about all the fun theory for Dynamic Tonality. In the meantime, feel free to visit the contact section and email us for further information. This site is maintained by Anthony Prechtl and Andrew Milne. Feel free to e-mail us if you have any questions: aprechtl [ a t ] gmail [ d o t ] com, or andymilne [ a t ] dynamictonality [ d o t ] com.